I'm always a little sad when great resource books go out of print, and then excited when they get re-released. 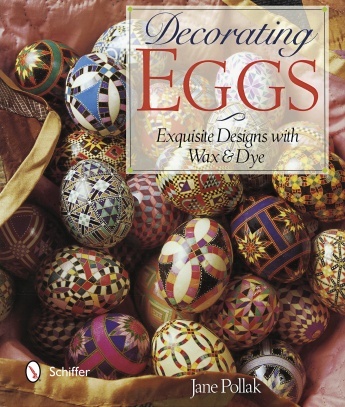 If you've ever had an interest in pysanka eggs, this book has almost everything you need to know about the art. So I'll start with what it doesn't have- instructions for centering a design on an egg. Those can be found easily enough in other books and on the internet. What it does have? Tips, instructions and design help from someone who spent decades decorating eggs for sale, doing shows, teaching people how to do it, and becoming very, very good at it. It starts with a list of the tools and supplies you'll need. Starting with how to find the right kind of eggs, and the difference between types of kitskas then explaining the wax, dyes and finishing techniques. This is not strictly traditional, because there are a lot of time saving tools used, like rotary tools for cutting, egg blowers and polyurethane. All of which help you make a better finished egg and give you more time for creating your art. Next, a step by step tutorial tells you how dye, explains the order of the colors you use, and how to apply wax. Then it tells you how to get the wax off your colored egg and how to finish it for display. None of that is the best part of this book, which is full of color photos and display ideas. The best part is the design ideas, the author shows how designs can be taken from other arts, textiles like batik- which also uses wax for resisting color are natural, but the geometric quilt designs are my favorite. The examples show how color can radically alter a simple geometric design, and where to look for ideas. Lacey designs, designs that look like henna, showing how different lengths of time in a dye bath can create great tone on tone effects are all part of the ideas offered. For more traditional designs, there is a great chapter on the meaning of the design elements in Ukrainian eggs, it explains motifs, bands and color usage with sketched examples and gorgeous photos of eggs. If you want to design an egg specifically for a person that would have relevancy and be traditional, this information is fantastic. At the end of the book, there is information about designing jewelry from eggs. How to cut them and stabilize them to create brooches, barrettes and pendants. It encourages you to play. That you can go traditional, but that you can also decorate an egg to fit your own personality. It takes a lot of the mystery out of these gorgeous eggs, and makes the basic techniques less scary. I recommend this book to anyone interest in egg art, but also to people who haven't ever considered it but do things like zentangles or henna. The same designs you build on paper or skin will work on these eggs for a new way to display and market your art.